Cook pasta. While pasta is cooking, heat oil in large skillet; add onion and garlic. 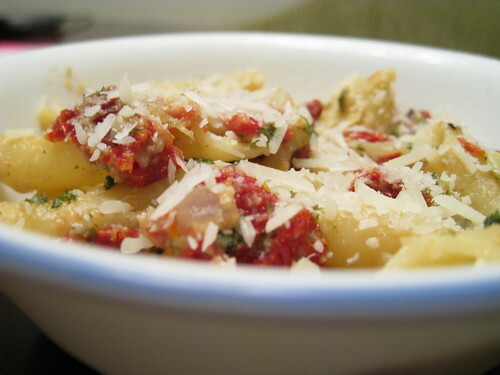 Cook until onion is soft; add artichokes, sun-dried tomatoes, bread crumbs, and parsley; heat through. Add 2 ladles of water that pasta is cooking in to artichoke mixture. Drain pasta and add to artichoke mixture. Transfer to serving dish; sprinkle with Parmesan cheese. Serves 10.